The immunogen for anti-MYC antibody: synthetic peptide sequence AEEQKLISEEDLL corresponding to the C-terminal region of human c-myc. Fusion Partners: Spleen cells from immunised Balb/c mice were fused with cells of the myeloma cell line. 1. Evan, G.I. et al. 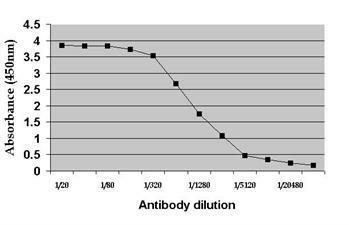 (1985) Isolation of monoclonal antibodies specific for human c-myc. Proto-oncogene product. Mol. Cell. Biol. 5: 3610 -3616. 2. Spandidos, D. A. et al. (1987) Elevated expression of the myc gene in human benign and malignant breast lesions compared to normal tissue. Anticancer Res. 7: 1299 -1304.